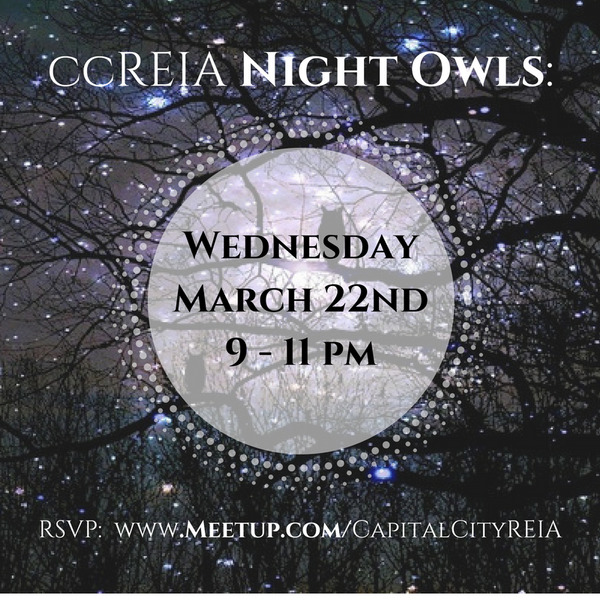 That often times the BEST networking and deals getting done are at “The Meeting After the Meeting!” So this year Capital City REIA is bringing back Nite Owls. Immediately following the Capital City REIA Main Monthly Meeting we will be waiting for you at Joe Theismann’s Restaurant & Bar for a Nite of Networking & Friendship! All are invited to join us! When everyone else's day ends, we are just getting started! Don't miss our Meeting AFTER The Meeting - Night Owls ? Networking Booster. Bring lots of business cards! And be ready to meet some serious Action Takers! Remember, People like to do business with people they like! Heck, in life in general – people only really like to be around people they actually like! It’s not a topic to gloss over! If you can't make it to the Main Meeting OR you just want to take advantage of this amazing opportunity, join ccREIA Night Owls on Wednesday at 9 PM.